After a week in Glacier, we opted for a change in scenery before heading back to Whidbey Island. 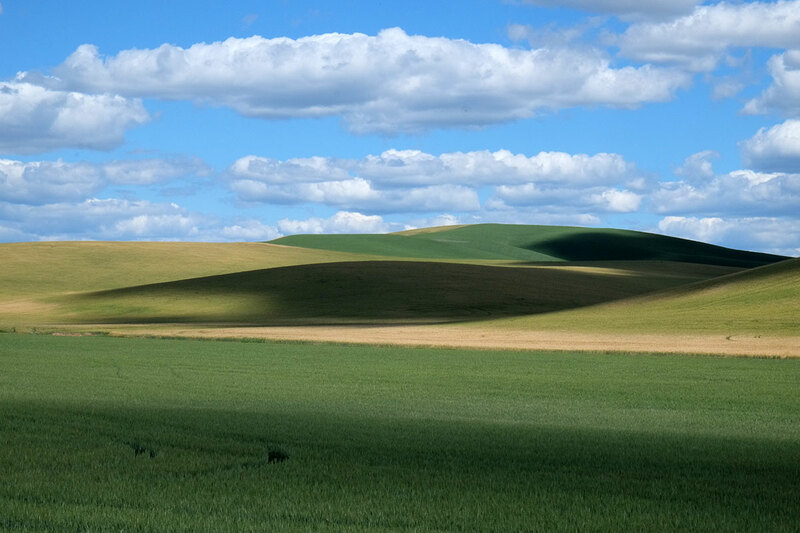 The Palouse is an area about which we had long heard from our Coupeville friend Jug Bernhardt, who grew up on his family’s farm there, and I thought Linda would especially enjoy some quiet pastoral beauty after the rugged alpine sublimity of Glacier. The landscape couldn’t be more different from the Rockies, but in many ways it is equally beautiful. 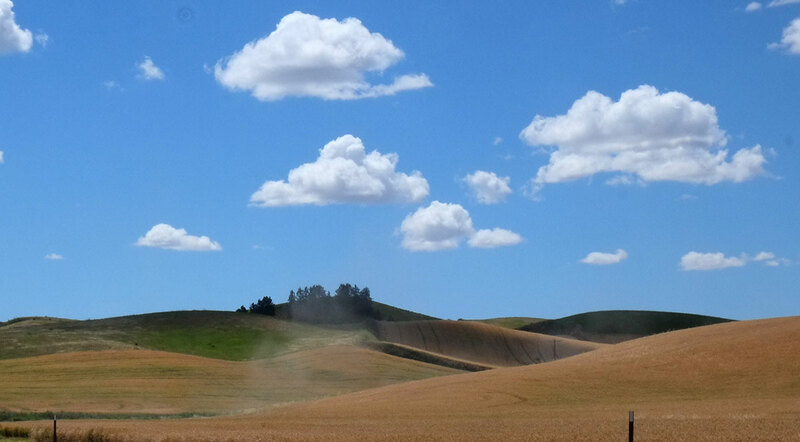 Occupying the southeast corner of Washington, the Palouse has one dominant landscape type: rolling hills. But rolling hills on acid. 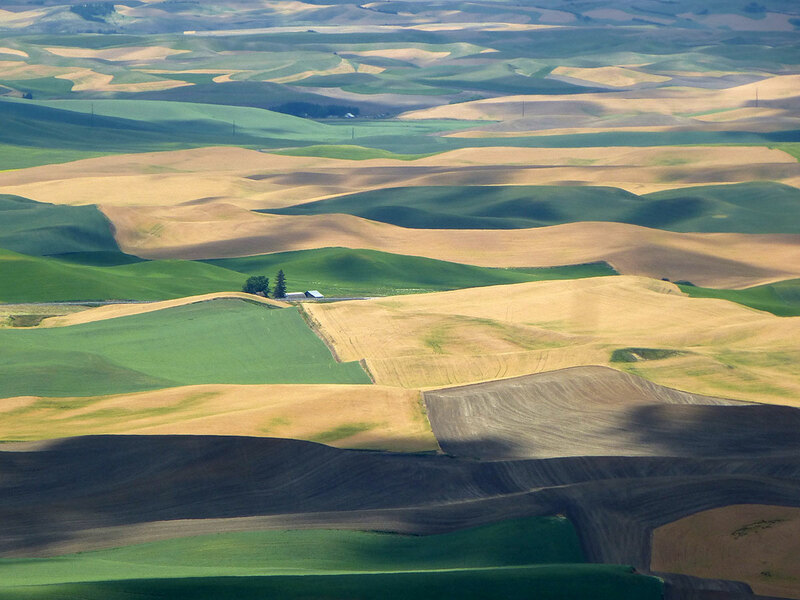 It is the landscape a five-year-old would draw if you asked for a picture of farmland (but minus the cows). 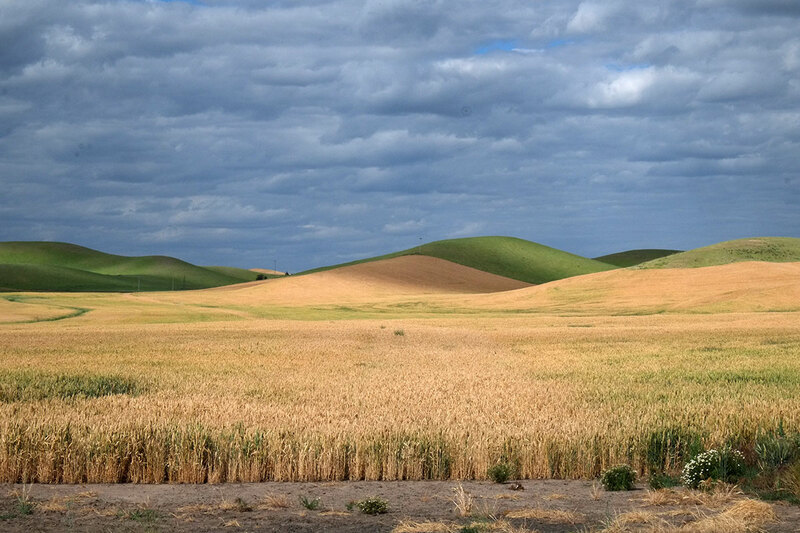 If you think of any rolling farmland with which you’re familiar, and then compress the horizontal scale by a factor of five, that’s the Palouse. As you drive through the landscape, you are enclosed by the topography. I don’t know why, but the national grid of townships and straight roads was not imposed here, even though it wasn’t heavily settled until the 1870s. Roads curve in and out of the hills, and you are always at the bottom of a trough, with the horizon a half mile away. 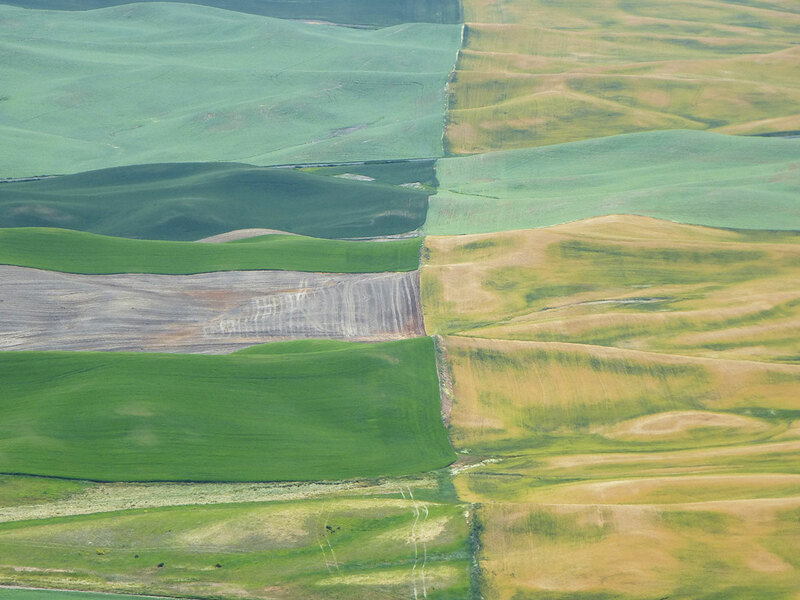 The color palette is also primal and surreal, limited to five tones at this time of year: tan fields of wheat, green fields of alfalfa or other secondary crops, blue sky, white clouds, and black shadows moving across the land. It is strangely devoid of people, or much evidence of their presence. 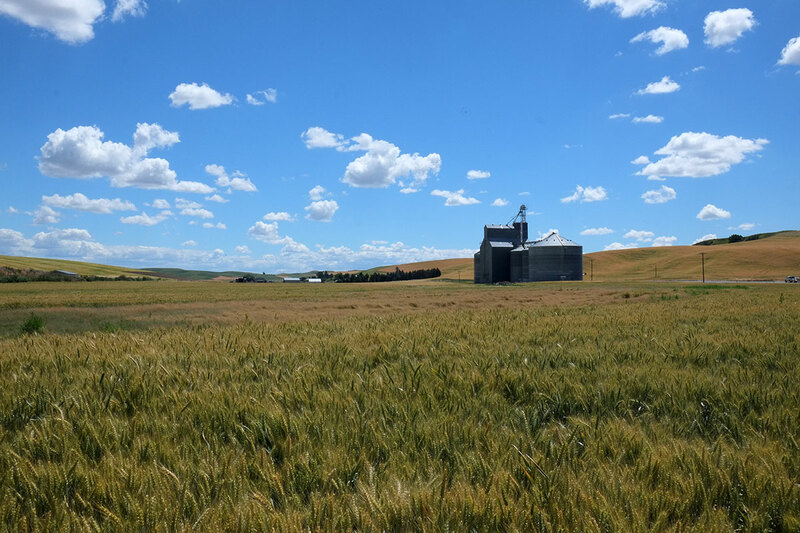 In our era of gigantic agribusiness, a wheat farm in the Palouse has to be around 2000 acres (over three square miles) to be economically viable, so there are few farmsteads to interrupt the landscape. It feels like a wilderness of wheat, rather than the pastoral ideal of people and nature in a finely-grained net of inhabitation. The built elements you do see are seldom quaint farmhouses or curving fences (there is very little livestock, so fences are almost nonexistent), but the large, shiny, cubic geometries of grain elevators. The contrast between the curvilinear landforms and the rigidly orthogonal elevators is the best illustration I’ve seen of Marc Treib’s ideas in “Traces Upon the Land”, and I’ll certainly be using these photos in my lectures next year. 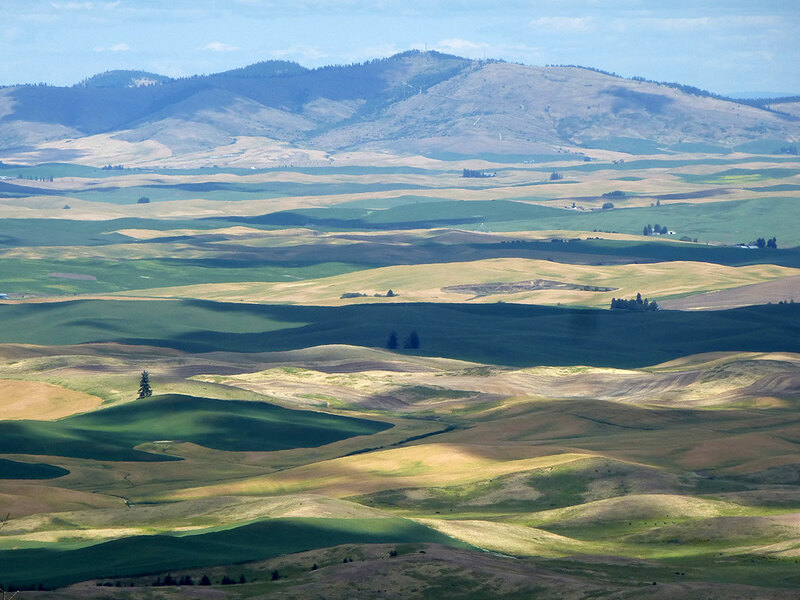 A couple of buttes poke up out of the hills, so we drove to the top of Steptoe Butte to see the big picture. It looked no less weird from there than it did from below. We did spot some attempts to make straight lines, but they were foiled by the irregularities of the hills. The big view confirmed our perception that the built world occupied a small fraction of the land. 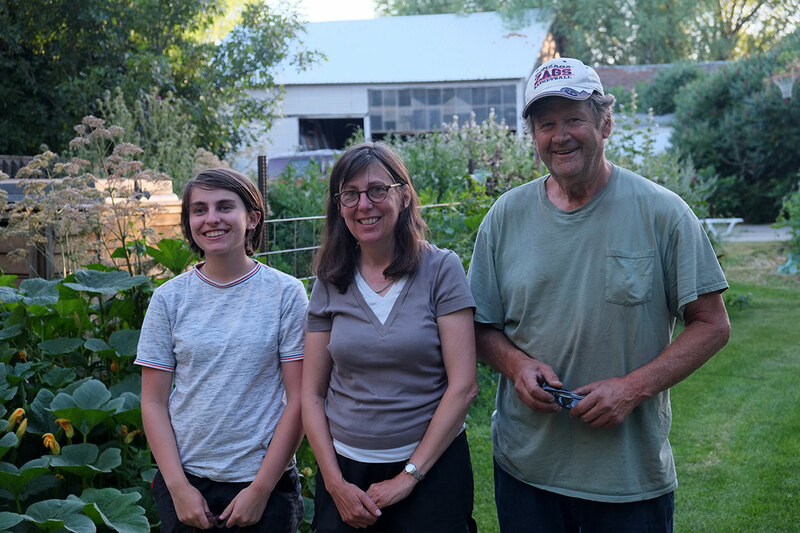 When I expressed some interest in the Palouse a couple of years ago, Jug put me in touch with his boyhood friend Tom Schierman, who lives on land his family has farmed for a few generations outside of St. John. Tom is an extraordinary photographer, who always has his camera with him as he goes about his normal day, and his photos on Facebook convinced us to visit the area. Tom and his son James host campers on the back meadow on their property (listed on Airbnb as Schierman Springs). They have only one party camp there at a time, whether it is one small family such as ours, or a large group. So we (in the small trailer pictured below) had this secluded field to ourselves, with only the owls and coyotes interrupting the quiet (quite a difference from the campgrounds at Glacier, where we were surrounded by RVs from the South with generators and many children). that contrasts strongly with the simpler abstract environment that lies outside. In an essay on the world as chronicled and evaluated by Baedeker, Roland Barthes remarked on how the only landscape type deemed worthy of notice by the 19th century tourist guidebooks was the precipitously steep; flat landscapes were somehow never beautiful enough. 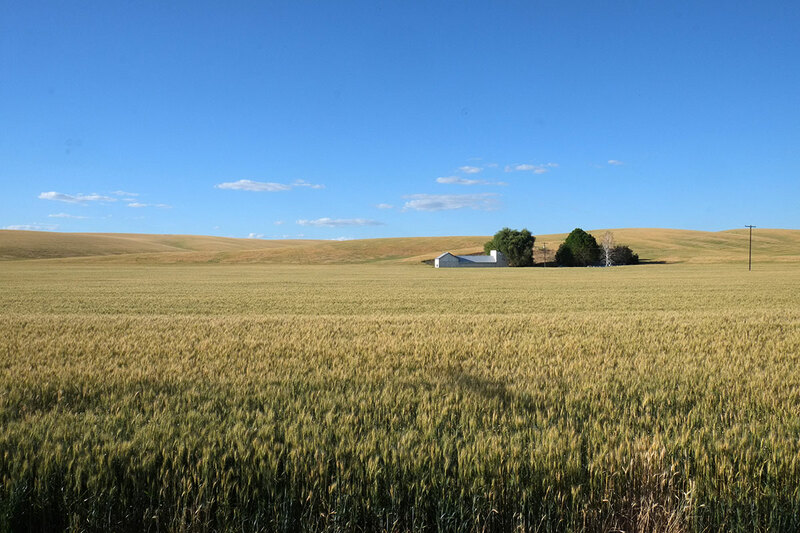 But somehow after a week in the most astonishing alpine scenery on this continent, we found a few days in the Palouse to be equally engaging. This entry was posted in landscape and tagged #vanlife on July 23, 2018 by Peter.